What follows is a detailed description of Steven Stern's two-week cruise on Viking Sea from Bergen to Athens. Stern's Guide to the Cruise Vacation is awarding 6 stars in the deluxe premium category to Viking Ocean Cruise ships. This follows the news just last month that readers of Travel & Leisure magazine had rated Viking as the Number 1 Ocean Cruise Line in the world. Since the establishment of Viking Cruises in 1997 by a Scandinavian and Dutch consortium, the company has launched more vessels than any other cruise line in history. Amazingly, fifty-one of their European riverboats have debuted since 2002 with more to come. Commencing in 2015, Viking entered the ocean cruise ship market with two ships presently sailing and four more to enter service by the end of 2019. In addition, Viking riverboats offer cruises in the waters of Russia, Ukraine and Myanmar and are scheduled to soon ply the rivers of the U.S. Regularly disseminating an unprecedented amount of promotional brochures and television ads, Viking has become the most well-known name in river cruising. Once you get on their mailing list, you can expect to be inundated with brochures on a regular basis. As an author of travel guide books, I can only imagine the cost of such a plethora of advertising. However, it seems to pay off judging from the company's phenomenal success. Never having sailed on Viking's new ocean ships and not having sailed on their river boats for over three years, I booked back to back cruises on one of each to compare the experiences. I started with a 14-day riverboat cruise on Viking Ingvi from Budapest, Hungary to Amsterdam, Holland followed by a 14-day ocean cruise on the new Viking Sea from Bergen, Norway to Athens, Greece. I was most curious to see how inaugurating and staffing so many ships in such a short period would work out. After a night at the Clarion Hotel in Bergen we boarded, in the afternoon, the Viking Sea beginning our next two-week adventure, this time at sea. Our first impression was 'wow'! The non-traditional layout and understated Scandinavian décor was so impressive we had the feeling of being in a deluxe hotel rather than on a ship. Entering service in the spring of 2016, the 47,800-ton, 930-passenger Viking Sea, the second of the company's ocean-going ships, features all-veranda accommodations with none less than 221 square feet (plus a 57 square-foot veranda). Perks include complimentary wine, beer and soft drinks with lunch and dinner, complimentary specialty coffees and room service around the clock, complimentary Wi-Fi, self-service laundry facilities on each floor, multiple dining venues all free of charge, movie theaters with first-run films, enrichment programs and at least one complimentary shore excursion in each port. Mini-bars stocked with alcoholic and nonalcoholic beverages daily are located in 75% of the cabins sand suites. In addition to the 221+ square-foot Veranda staterooms, there are one hundred four 272 square-foot Penthouse Veranda staterooms with 69 square-foot verandas, thirty-two 329 square-foot Penthouse Junior Suites with 85 square-foot verandas, fourteen Explorer Suites ranging in size from 490 to 700 square feet with verandas of varying dimensions, and a 1,448 square-foot Owner's Suite. Every accommodation has a king-size bed with luxury linens, a sitting area, a desk/make-up table, Wi-Fi, movies on demand, robes, slippers and luxury toiletries, a large flat-screen LCD TV, direct-dial satellite phone and cell service, a coffee maker, a security safe, a large glass-in shower, a hair dryer and 110/220-volt outlets. Upon boarding, we were escorted to our stateroom which was one of the 221 square-foot veranda variety. We found it quite roomy and comfortable as compared to standard, non-suite staterooms on other ships. We then embarked on an exploration of what was to be our floating hotel for the next two weeks. The first level of the three level atrium included an expansive lobby, reception area with customer service and excursion desks, a beverage and snack bar, shops, and spa and fitness facilities. Most impressive was the spa area with its Thalassa pool, steam, sauna and ice rooms available at no extra charge. However no exercise or spa classes were offered. Also at this level were Manfredi's Italian Restaurant and The Chef's Table, the two specialty dining venues. Throughout the cruise we enjoyed dining in all of the three dinner venues. The variety of selections was impressive, as was the excellence of the offerings. The specialty restaurants required reservations and diners in all restaurants needed to be seated by the ma"tre d's. Located on the second level (Deck3) were two long halls with a variety of board games, as well as shops, the nightclub, two cinemas, the main theater used for shows and lectures, and the three-meal-a-day main dining room. Most of the other public facilities were located on Deck 7 which included the World Café, buffet restaurant, its adjoining Aquavit Terrace, with indoor and outdoor dining tables and an infinity pool; the main pool with a retractable roof, the pool grill and pool bar; the Wintergarden, a glassed-in relaxation area where afternoon tea is served; and the two-story Explorer's Lounge and bar, the ideal place for an evening cocktail accompanied by music. Light breakfast and lunches were served here, as well as late afternoon and late evening snacks. Above the Sun Deck was the Sport Deck with a long practice putting green, an exercise course and shuffleboard court. The first evening aboard, we were introduced to various entertainers and lecturers who would be performing and lecturing throughout the cruise. Each evening there was a musical performance in the Theater, as well as a band with a singer for listening and dancing in the night club. A piano player, guitarist and string quartet, offered musical background at the various bars in the evenings. The different lecturers gave talks on a variety of subjects on a daily basis. Educational lectures were a large part of the daily programs. We were surprised that the passengers from the British Isles outnumbered the Americans. Obviously Viking must market as aggressively across the pond as it does in North America. The next day, we remained docked in Bergen and we took the included walking tour of Bergen. An optional tour was offered to a Norwegian farm. As on the Viking riverboats, one tour at each port was included in our fare, and several optional tours were offered for a charge. However, this cruise was far less port intensive than our prior cruise on the Viking Ingvi with only 8 days in port and 6 days at sea. Our first port of call was Le Havre, France the entry port to Paris and Northern French cities. The excursion that was included was bus transportation to Paris with a short orientation tour followed by three hours of free time to explore the city. Optional Paris tours were either a tour of the Louvre or lunch at the Eiffel Tour (at Restaurant 58, not Jules Verne). Those having been to Paris previously and not wishing to spend such a long day could opt for the optional tour to the charming seaside village of Honfleur, the drive to Normandy and the WWI sites, or a visit to Rouen and the Claude Monet house in Giverny. After two days at sea, we reached our second stop, Lisbon, Portugal. Included was a highlights of the city bus tour which spent more time in neighboring Belem than in Lisbon. Alternatively aspiring cooks could take a tour with the ship's chef to the local markets followed by hands-on participation preparing dishes for the evening. Other optional tours included a tram ride touring the city's seven hills, a funicular ride, and a trip to the town of Sintra. The next day we arrived at Cadiz Spain. Included here was a walking tour of the city. Other possibilities were the half-day tour of the historical city of Seville and its Gothic Cathedral where Christopher Columbus is entombed, as well as an excursion to Arcos de la Frontera and Jerez with a sherry tasting, or a visit to a bull and horse breeding farm. That evening the talented cast of entertainers held a tribute to the Beatles on deck around the pool. This event was well received by the passengers and followed by dancing to the ship's outstanding orchestra. On all of the other evenings there was a different musical presentation in the theater and an additional show in the night club as well as music for dancing. At Malaga, Spain, an overview walking tour of the city was included. The optional tours offered were a bus tour to the 14th-century Gibralfaro Castle and the stunning Alcazaba Palace, built in the 11th century as the residence of Arabian caliphs and kings, a drive to Granada with a tour of the famous Alhambra Castle and gardens, or a drive to the resort town of Marbella followed by time to roam through the colorful harbor town of Puerto Banus with its luxury yachts, designer boutiques, upscale shops, restaurants and cafes. Shuttle service to town from the ship was offered on the half hour. After two more days at sea, we reached Valletta on the Island of Malta. A scenic drive around the island was the included tour. Optional choices were a visit to the 18th-century Palazzo Parisio, an opulent and grand residence of a baroness, a visit to the fishing village of Marsaxlokk, or visits to the towns of Media and Valletta. Not having had any beach days on this trip, we preferred to take a taxi to the fishing village of St Julians, the location of the fabulous ocean-side Hilton Hotel Malta with its white sand beaches and numerous pools. The village offered numerous opportunities to enjoy freshly caught fish which you could select while they were swimming in the restaurateur's fish tank. For those who are a bit adventurous and comfortable doing their own research, there were many other options during the cruise other than those offered by the cruise line. However, for those, not comfortable venturing out on their own, the cruise line did offer an abundance of escorted tours. Our last destination was Athens, Greece where we were to have a full day and night on the ship before we had to disembark. However, the ship had a mechanical problem as we were leaving Malta and this delayed its departure. As a result we did not reach Athens until 10:00 pm the night before we were to disembark. The passengers naturally were disappointed; however the cruise line did indicate that it would make some manner of reparation. The next morning, we availed ourselves of the complimentary transportation to the airport. Ironically, this cruise was originally scheduled to terminate in Istanbul, Turkey. Fortunately, changes were made in advance even before the terrorist bombing at the airport. After a month of cruising, we had a chance to sit back on the plane home and reflect on the incredible amount of things we had experienced. During our cruise, we had the opportunity to seek out the opinions of some of the other passengers. The majority indicated that it was the best ship they had ever cruised on. The ship especially appealed to the large demographic of British passengers who especially appreciated the entertainment and lectures. Everyone agreed that the service was exemplary and the dining outstanding at every venue. Especially appreciated were the many extra perks available, unusual for a ship in its cruise market. For the most part, I would have to agree; however, some cruisers will need to get comfortable with a ship, which although exceptional, is still different in many ways from what they may have previously experienced, notably no casino, no exercise or spa classes, no lavish production shows, and a unique layout. The cruise line says that their clientele does not miss these features. One thing for certain, Viking is well adept at running cruise ships as well as riverboats. 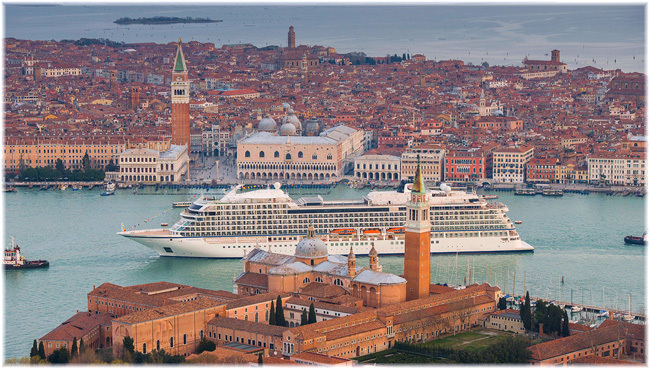 We believe that Viking Ocean Cruises will be a very strong competitor in the upper premium cruise ship market. We have awarded Viking Ocean Cruises 6 stars in the deluxe premium category in the 2017 edition of Stern's Guide to the Cruise Vacation available September 2016. More images and info of the "Viking Sea"